Action from Peterborough Sports' 4-1 win over Deeping Rangers. Sports are in blue. Photo: David Lowndes. Peterborough Sports confirmed their status as top dogs in United Counties League football with a resounding 4-1 win over Deeping Rangers at PSL today (January 14). 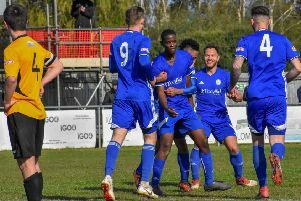 It was billed as a ‘clash of the titans’ between all-conquering Sports and a Deeping Rangers side unbeaten in their previous 21 Premier Division games. Avelino Vieira of Peterborough Sports during the 4-1 win in the United Counties Premier Division over Deeping Rangers. Photo: David Lowndes. But leaders Sports delivered a fatal three-goal burst in the final 15 minutes of the first-half to effectively seal the points. Supersub Stuart Eason was the home hero scoring the first two goals after arriving as a 22nd minute replacement for Mark Jones. John MacLeod also netted before the break before Avelino Vieira added a fourth goal 10 minutes after the re-start. Deeping replied with a classy finish from top scorer Scott Coupland midway through the second-half, but the visitors, who started the day in second place, finished the day badly as striker Scott Mooney was dimissed for hurling foul and abusive language at assistant referee Damon Pywell. Lewis Webb (blue) in high-kicking action for Peterborough Sports against Deeping Rangers. Photo: David Lowndes. The win pushed Sports seven points clear at the top. Eynesbury moved above Deeping into second even though they only drew 4-4 at Sileby. Wisbech Town took over from Deeping as proud owners of the longest local unbeaten run as they made it 15 games undefeated in all competitions with a terrific 5-3 win at Newport Pagnell. Pagnell had dumped Sports out of the FA Vase in their previous outing. The teams traded goals early on with Michael Frew opening the scoring for the Fenmen, but Wisbech then raced away with further goals from youngster Harry Limb (2), Adam Millson (penalty) and Billy Smith. Pagnell scored twice in the final stages to give some respectability to the final scoreline. Wisbech are up to eighth. Yaxley are flying higher as goals from centre-back Stuart Wall and striker Dan Cotton secured a 2-0 win at Leicester Nirvana. The Cuckoos are fifth and have closed the gap on third-placed Deeping to four points. James Hill Seekings (stripes) scores Peterborough Northern Star's consolation goal against Oadby. Photo: Tim Gates. Peterborough Northern Star went down 2-1 at home to Oadby to stay in the bottom half of the table. James Hill-Seekings scored a late consolation goal for the city side. Recent managerial appointment Seb Hayes is not finding his job easy at Holbeach United. The Tigers went down 4-2 at home to Division One promotion contenders Olney Town in the quarter-final of the League Cup. In Division One there was a first win for new boss Andy Lodge as Blackstones trimmed up struggling Burton Park Wanderers 4-0, but Bourne were shaded in a seven-goal home thriller by Buckingham Town. Bourne fought back from 0-2 and 2-3 down to draw level before conceding a late winner. Tyler Sculthorpe, Aaron Jesson and Craig Rook scored the Bourne goals. The men on the mark for Stones, who have signed former Posh full-back Gareth Jelleyman, were Steve Mastin, Josh Russell, Matt Simpson and Jack Bates. The other big top-of-the-table clash in the area today was won by Shaw Lane in Division One South of the Evo Stik Northern League. They pipped second place Spalding United 1-0 at the Sir Halley Stewart Field with the Tulips frustrated by a superb goalkeeping display. Spalding remain four points ahead of third, but Shaw Lane are six points clear at the top with three games in hand. Stamford AFC strolled into a 2-0 lead in 13 minutes at lowly Market Drayton, but went down 4-2. Delroy Gordon and Courtney Meade scored for a Daniels side who just can’t get their league season going. March Town United claimed a creditable 0-0 home draw against Thurlow Nunn Division One top dogs Coggleshall Town. Spalding United 0, Shaw Lane 1. Peterborough Sports 4 (Eason 2, Vieira, MacLeod Deeping Rangers 1 (Coupland). Burton Park Wanderers 0, Blackstones 4 (Bates, Simpson, Mastin, Russell). Holbeach United 2, Olney Town 4.